Yonkers, NY — Owner Evan Katz makes a habit of perusing the listings on online auction sites. In fact, he checks them almost daily in the hopes of finding another horse to add to his stable. When Katz came across a listing for Itty Bitty in the fall of 2016, he found a diamond in the rough. Then a freshman, the pacing filly by Always A Virgin out of the Warrior For Peace mare Bananih had 15 starts on the Indiana fair circuit for owner, trainer, and driver Charles Conrad. Itty Bitty earned two wins and another eight seconds and thirds, but it was her finishing ability that caught Katz’s eye. In her final start for Conrad, Itty Bitty came home in :27.4 at the Fayette County Free Fair in Connersville, Ind. Itty Bitty was a 1:55 winner last Friday in the $44,000 Filly and Mare Open Handicap at Yonkers Raceway. Mike Lizzi photo. Katz gave Itty Bitty to Billy Parker and sent her to Monticello for her first start subsequent to the auction. They spotted her in a $3,300 overnight for non-winners of a pari-mutuel race Oct. 5, 2016. Itty Bitty’s rivals proved vastly over-matched as she circled the field and stormed away to an 18 length win. She stopped the clock in 2:00.1 with a :27.3 final quarter. Shortly after that start, Katz gave Itty Bitty to trainer Andrew Harris, who along with Bob Darrow, bought an ownership interest in the filly. In 70 starts, Itty Bitty has amassed 17 wins, 11 seconds, and 10 thirds, good for $220,377. 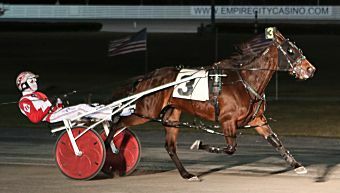 Her biggest victory to date came last Friday (Jan. 11) when she took the $44,000 Filly and Mare Open Handicap at Yonkers Raceway. Starting from post three with Jason Bartlett in the sulky, Itty Bitty watched as Wishy Washy Girl took command from post five around the opening turn. Bartlett wanted the lead, however, and pulled Itty Bitty entering the backstretch. The pair made the lead in a :27.4 opening quarter and the even-money favorite never looked back. With Bartlett comfortable in the bike and with a good hold of her, Itty Bitty increased her margin to 2-1/2 lengths past three-quarters. By the time she reached the top of the lane, she increased her advantage to 4-1/2. Itty Bitty cruised past the finish 5-1/4 lengths clear of the field in 1:55. “Andrew does a great job with her, as with all the horses I have with him,” Katz said. “He deserves a lot of the credit. To keep her sharp, keep her happy. He’s always on top of things. He’s probably the only trainer that talks to me every day and tells me what’s going on. Very honest guy. Itty Bitty’s competition includes last week’s runner-up Clear Idea, who makes her second start off a winter freshening and may be better poised to utilize her characteristic early speed. She’s 3-1 on the morning line for Matt Kakaley. Brazuca ships in from the Meadowlands off a third in their top class for distaffers Dec. 28 and drew post three. Ella Michelle A, Culinary Delight N, Amateur Hour, and Made Of Jewels As complete the field. First post time Friday is 6:50 p.m. For entries to the races, click here.